As a merchant you can keep an up to date list of your customers in your eMerchant Gateway Customer Billing Database. As a merchant, it’s vital to have an up-to-date list of your customers available at all times. 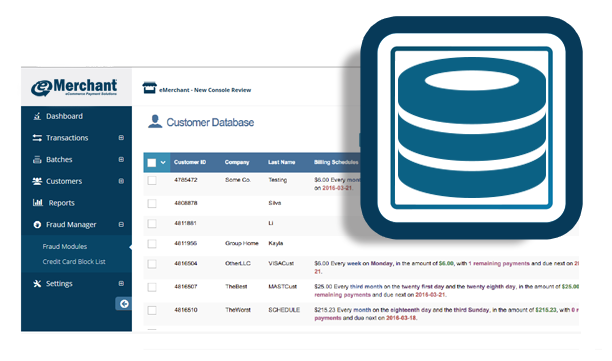 eMerchant Gateway’s Customer Billing Database is a simple-to-use but advanced service that allows you to store, access, edit and delete your customers and their billing data. Our Customer Billing Database also allows you to set up multiple billing options, including checks. You can even put together recurring billing plans for you customers. By allowing your customers to keep multiple credit cards as well as checking options on file, they’ll feel secure and happy knowing their payments are being made in a timely fashion, without them having to re-enter their billing information every time.